It becomes fairly evident that in the fifth and sixth centuries A.D. not merely Persia, but the regions that are now Turkestan and Afghanistan were far more advanced in civilization than were the French and English of that time. The obscurity of the history of these regions has been lifted in the last two decades, and a very considerable literature written in languages of the Turkish group has been discovered. These extant manuscripts date from the seventh century onward. The alphabet is an adaptation of the Syrian, introduced by Manichaean missionaries, and many of the MSS. discovered–parchments, have been found in windows in the place of glass–are as beautifully written as any Benedictine production. Mixed up with a very extensive Manichaean literature are translations of the Christian scriptures and Buddhistic writings. Much of this early Turkish material still awaits examination. Everything points to the conclusion that those centuries, which were centuries of disaster and retrogression in Europe, were comparatively an age of progress in Middle Asia eastward into China. A steady westward drift to the north of the Caspian of Hunnish peoples, who were now called Tartars and Turks, was still going on in the sixth century, but it must be thought of as an overflow rather than as a migration of whole peoples. The world from the Danube to the Chinese frontiers was still largely a nomadic world, with towns and cities growing up upon the chief trade routes. We need not tell in any detail here of the constant clash of the Turkish peoples of Western Turkestan with the Persians to the south of them, the age long bickering of Turanian and Iranian. We hear nothing of any great northward marches of the Persians, but there were great and memorable raids to the south both by the Turanians to the east and the Alans to the west of the Caspian before the big series of movements of the third and fourth century westward that carried the Alans and Huns into the heart of Europe. There was a nomadic drift to the east of Persia and southward through Afghanistan towards India as well as this drift to the north-west. These streams of nomads flowed by Persia on either side. We have already mentioned the Yue-Chi (Chap. XXVIII, sec 4), who finally descended into India as the Indo-Scythians, in the second century. A backward, still nomadic section of these Yue-Chi remained in Central Asia, and became numerous upon the steppes of Turkestan, as the Ephthalites or White Huns. After being a nuisance and a danger to the Persians for three centuries, they finally began raiding into India in the footsteps of their kinsmen about the year 470, about a quarter of a century after the death of Attila. They did not migrate into India; they went to and fro, looting in India and returning with their loot to their own country, just as later the Huns established themselves in the great plain of the Danube, and raided all Europe. The history of India during these seven centuries we are now reviewing is punctuated by these two invasions of the Yue-Chi, the Indo-Scythians who, as we have said, wiped out the last traces of Hellenic rule, and the Ephthalites. Before the former of these, the Indo-Scythians, a wave of uprooted populations, the Sakas, had been pushed; so that altogether India experienced three waves of barbaric invasion, about A.D. 100, about A.D. 120, and about A.D. 470. But only the second of these invasions was a permanent conquest and settlement. The Indo-Scythians made their headquarters on the North-west Frontier and set up a dynasty, the Kushan dynasty, which ruled most of North India as far east as Benares. The chief among these Kushan monarchs was Kanishka (date unknown), who added to North India Kashgar, Yarkand, and Khotan. Like Asoka, he was a great and vigorous promoter of Buddhism, and these conquests, this great empire of the North-west Frontier, must have brought India into close and frequent relations with China and Tibet. We will not trouble to record here the divisions and coalescences of power in India, nor the dynasties that followed the Kushans, because these things signify very little to us from our present point of view. Sometimes all India was a patchwork quilt of states; sometimes such empires as that of the Guptas prevailed over great areas. These things made little difference in the ideas, the religion, and the ordinary way of life of the Indian peoples. Brahminism held its own against Buddhism, and the two religions prospered side by side. The mass of the population was living then very much as it lives today; dressing, cultivating, and building its houses in much the same fashion. The irruption of the Ephthalites is memorable not so much because of its permanent effects as because of the atrocities perpetrated by the invaders. These Ephthalites very closely resembled the Huns of Attila in their barbarism; they merely raided, they produced no such dynasty as the Kushan monarchy; and their chiefs retained their headquarters in Western Turkestan. Mihiragula, their most capable leader, has been called the Attila of India. One of his favourite amusements, we are told, was the expensive one of rolling elephants down precipitous places in order to watch their sufferings. His abominations roused his Indian tributary princes to revolt, and he was overthrown (528). 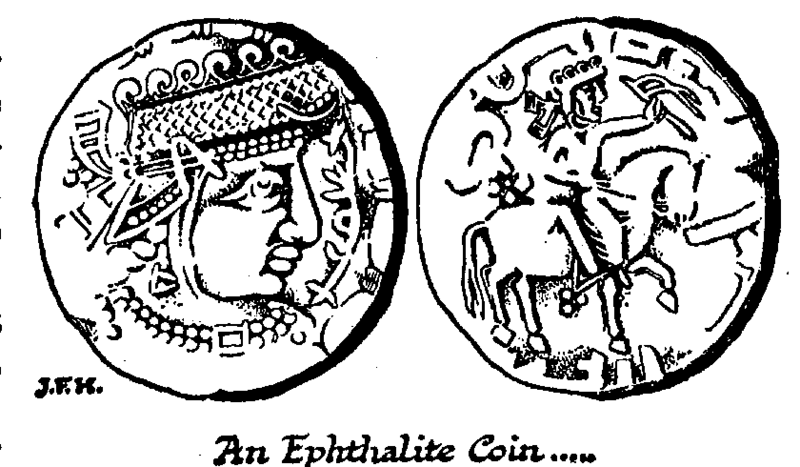 But the final ending of the Ephthalite raids into India was effected not by Indians, but by the destruction of their central establishment of the Ephthalites on the Oxus (565) by the growing power of the Turks, working in alliance with the Persians. After this break-up, the Ephthalites dissolved very rapidly and completely into the surrounding populations, much as the European Huns did after the death of Attila a hundred years earlier. Nomads without central grazing lands must disperse; nothing else is possible. Some of the chief Rajput clans of today in Rajputana in North India are descended, it is said, from these White Huns.